If you have recently invested in a high efficiency gas furnace for your home, there is a high probability that you will face certain technical difficulties with its operation in the near future. High efficiency gas furnaces are not common in Toronto and commonly suffer from venting problems. If you are planning to buy a high efficiency gas furnace, we tell you 5 reasons why you should invest in a rented furnace for sale in Toronto instead. They are affordable, have a good rating and come with good service package. Here are 5 venting problems that the high efficiency gas furnaces suffer from, and how a HVAC specialist in Toronto associated with a rental agency tackles them. High efficiency gas furnaces are also called as Condensing furnaces due to their structure and mode of operation. They have bigger and heavier exhaust combustion pipes compared to traditional furnaces, as they carry more flue through them. HVAC contractors ensure that the piping for the rented High efficiency gas furnaces are installed in such a way that the structure of the wall is not disturbed. The pipes are routed through the sidewalls. A rented HVAC equipment like high-efficiency gas furnace require extensive piping just like regular air-conditioners and furnace. 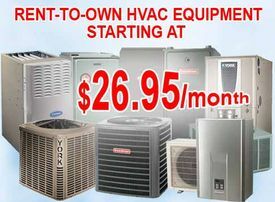 So get an experienced HVAC specialist to do it for you. If you see a difference of rating in any of the above mentioned things, report it to the HVAC furnace dealer. They will assess and get it replaced as per your package. Latest high efficiency gas furnaces come with thermostat settings and temperature sensors to give optimised heating effect. Indoor heating could be a costly affair if the rooms are not properly isolated and closed for leakages. With the proper high efficiency gas furnace installation, you can control the energy consumptions and also expect better run for your money, even if it is invested in a rental furnace or on a furnace from sale. High efficiency gas furnaces have a special structure. The inlets and the outlets are usually erected side by side and not on opposite sides of the house. There are some furnaces with single pipe, which is exhaust pipe. Incorrect slope angles of the exhaust pipe can also result in poor efficiency. The HVAC furnaces are installed with slightly slanted back towards the furnace body. Proper venting of the exhaust pipe also ensures that snows and gravels don’t enter into exhaust pipe. A covered entry also ensures that birds and pests don’t enter the pipe. HVAC contractors in Toronto offer extensive plumbing and piping solutions for High efficiency gas furnace.